For those of you that have driven to Dubai via Hatta over the last few years, you may have noticed the worlds slowest construction project slowly move along - the Hatta Border post drive-thru. Being an ex-pat I thought this would mean I'd be able to get my visa on arrival just by driving through the border post (just like in the Al Ain border) and was looking forward to this opening. 1. 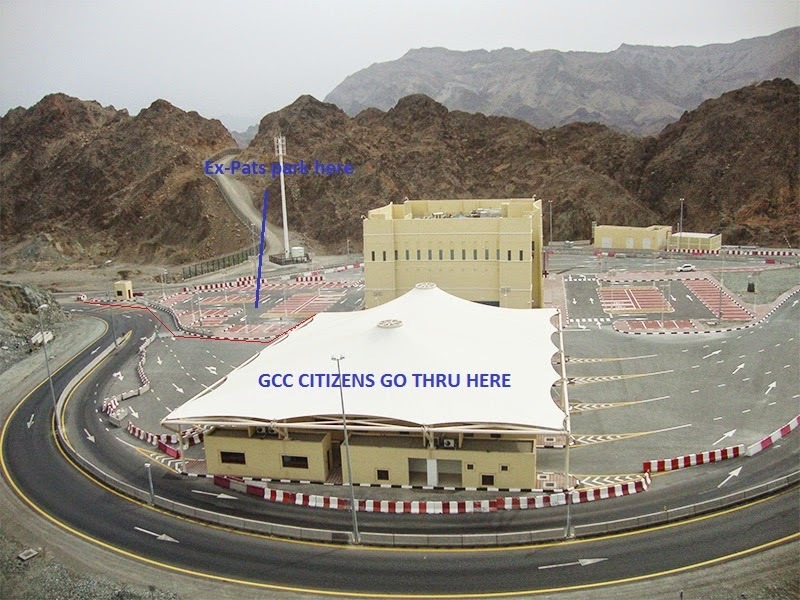 GCC Citizens only can drive through the kiosks, everyone else has to go inside to get a visa. 2. No one tells you this until you get to a kiosk. 3. The signs installed were clearly not read by anyone who understands English, I didn't take a photo, but they are nonsensical, and totally devoid of any useful information. 4. If you are an expat, get in the left lane, and park where the photo above shows you to. 5. Once you've got your gate pass, don't line up again, get someone to open the barrier closest to the main building and drive through. Thanks for climbing up the jebel to take that photo specially for your grateful readers Sythe! This is good info- it is unbelievable that after all that time they still haven't found a way of streamlining the system. Oh well. Lifesaver!!! I used to freak out everytime I passed there wondering if the kiosks would be open coz I knew there'd bound to be a supreme lack of information. How is it that mainland Europe can survive with zero border controls? Slow down to 20kph and just keep driving. Wasn't the GCC set up to make life better, easier, more efficient?